Festo, the same company that brought us the Air Ray robot last year, has developed yet another graceful robot inspired by a creature of the sea. In fact, they have developed two versions, both based on the common jellyfish: the AquaJelly and the AirJelly. 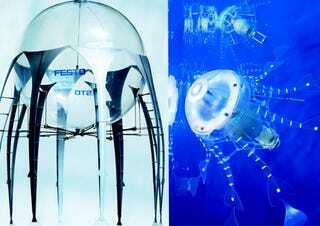 According to Festo, the AquaJelly is "an artificial autonomous jellyfish with an electric drive and an intelligent, adaptive mechanical system." Apparently the idea is to have several of the robots autonomously working together using a communication system composed of Zigbee short-range radio on the surface and LEDs when underwater. More info and videos after the break. As for the AirJelly, this remote controlled device can glide through the air using a helium-filled ballonet, a central electric drive and an intelligent, adaptive mechanical system. Apparently, this design offers "fascinating possibilities for "lighter-than-air" aviation." I'm not sure about all of that, but I can at see how the technology behind the AquaJelly could have some practical application on complex underwater projects. Still, practical or not, these robots are pretty damn interesting to watch in action, as the videos below illustrate. Check out the press release for full details. Nature never ceases to amaze us with its aesthetic beauty. It is no surprise therefore that nature's fascinating creatures also served as inspiration for the new projects of Festo's Bionic Learning Network. The structure and kinematics of AquaJelly and AirJelly are based on their biological model, the jellyfish. The test beds utilize cutting-edge technologies. AquaJelly, for example, is a man-made autonomous jelly fish with an electric drive and an intelligent, adaptive mechanical system. Festo's YoYo product illustrates that fully automatic control is possible with the aid of mechatronics - it also forms a bridge to the company's core competency, automation with air. AquaJelly is an artificial autonomous jellyfish with an electric drive and an intelligent, adaptive mechanical system. AquaJelly consists of a translucent hemisphere and eight tentacles used for propulsion. At the centre of the AquaJelly is a watertight, laser-sintered pressure vessel. This comprises a central, electric drive, two lithium-ion-polymer batteries, the charge control device and the servo motors for the swashplate. The structure of each tentacle uses the Fin Ray Effect® - a construction design derived from the functional anatomy of a fish fin. It moves with the aid of a peristaltic propulsion system, or wave-like contractions, based on the reaction thrust principle used by its biological precursor. The motion of the AquaJelly in three-dimensional environments is controlled by shifting its weight. Two servo motors integrated into the central pressure vessel actuate a swashplate. This swashplate controls a four-arm pendulum which can be steered in the four spatial directions. When a pendulum moves in a certain direction, the centre of gravity of the jellyfish changes in this direction. AquaJelly is capable of independently controlling its own energy supply, by means of communication between the AquaJelly and a charging station. Whenever the AquaJelly comes to a charger located above the water basin, it is sucked towards it and provided with electricity. For communication on the water surface, the AquaJelly can use the energy-conserving short-range radio standard ZigBee, which enables it to exchange status details with the charger and signal to other AquaJellies on the surface that the charger is occupied. The main communication medium under water, however, is light. The AquaJelly has eleven infrared light-emitting diodes with which it can communicate over distances of up to approx. 80 cm. The pulsed infrared signals are sent from inside an almost spherical structure around the AquaJelly. On receiving a position signal from an approaching jellyfish, for example, the AquaJelly can start its evasion manoeuvre in plenty of time. In addition to environment sensors, the AquaJelly also has internal sensors which monitor its energy level, as well as a pressure sensor which allows it to gauge its depth in the basin to within a few millimetres. Each jellyfish decides autonomously which action to carry out on the basis of its current condition. This central electric drive, combined with an adaptive mechanical system and intelligent autonomous electronics, opens up possible new applications for self-controlling systems. If a large number of AquaJellies were equipped with communicative abilities, these could act like a shoal with the behaviour pattern of a more highly developed system. If one applies this principle to automation, then numerous autonomous or semi-autonomous intelligent systems might be able to work together. In this way, large problems could be solved by small systems working together in harmony. Air is the element of the AirJelly. Rather than swimming through water like the AquaJelly, it glides through the air with the aid of its central electric drive and an intelligent, adaptive mechanical system. The remote-controlled AirJelly is kept in the air by its helium-filled ballonet. The AirJelly's only energy source are two lithium-ion-polymer batteries, to which the central electric drive is attached. This transmits its power to a bevel gear and then to eight spur gears, which drive the eight tentacles of the jellyfish via their respective cranks. The structure of each tentacle is based on the Fin Ray Effect®. Using a peristaltic movement to drive a balloon was previously unknown in the history of aviation. The AirJelly is the first indoor flying object to use such a peristaltic propulsion system. The jellyfish glides gently through the air thanks to this new drive concept based on the reaction thrust principle. The AirJelly steers through three-dimensional environments by shifting its weight. Its two servo motors are located at the "North pole" of the jellyfish and controlled proportionally. If the pendulum moves in one direction, the AirJelly's centre of gravity shifts in this direction - the AirJelly is thus able to swim in any spatial direction. The propulsive force of the drive can be varied by moving the Fin Ray® tentacles more quickly or slowly. Festo demonstrates with this exhibit that a central electric drive - combined with an intelligent mechanical system - can offer fascinating possibilities for "lighter-than-air" aviation. Festo aims to delight its customers with innovative, fascinating and intelligent solutions in both automation and didactics. It therefore offers a wide range of electric, pneumatic and hybrid drive systems, together with the respective sensors and control possibilities.